I know what you’re thinking, and no that hair company did not come out with a thyroid supplement. Instead, this is a formulation created by Dr. Josh Axe, a wellness physician and radio show host who holds a doctorate in chiropracty. Dr. Axe releases supplements individually as well as through different sub-brands such as Ancient Nutrition, Dr. Collagen, and ProBiome Rx. 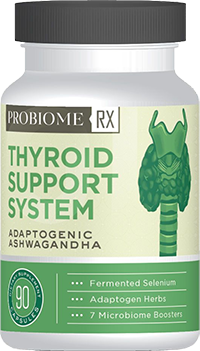 WHAT IS Dr. Axe’s Thyroid Support System? Even though I believe this product is off to a horrible start after learning about its background, I decided to look at what’s actually inside the capsules. The only ingredients I recognized were selenium, kelp, and ashwagandha extract. The rest seem to be probiotics aimed at fighting the “mythical” gut problem. I cannot speak about the effectiveness of the probiotics since I don’t really know much about them. I do know that the thyroid ingredients are certainly useful. Selenium is one of the enzymes that help convert T4 to T3. The proprietary blend consisting of kelp and ashwagandha extract can contain iodine, theoretically (since it is not listed in the vitamins/minerals area) and may support reducing stress. But these three ingredients hardly make a supplement on their own. Maybe the probiotics are useful specifically for the thyroid but a quick google search seems to suggest otherwise. This isn’t the first time Dr. Axe seems to be confused. After his appearance on the Dr OZ Show in late 2014, a lot of organizations attacked him for the unbiased claims he was spreading. As stated in this article, “most every thing Josh Axe said on the show was utter nonsense.” His thyroid support supplement seems to be much the same. 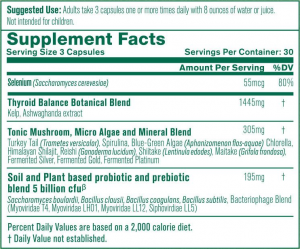 I cannot speak on its probiotic ingredients or whether it can actually support the gut and thyroid. 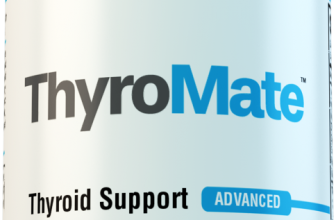 However, due to the very few thyroid ingredients in this supplement, it makes me question whether it can be a truly effective thyroid support supplement. In my opinion, without l-tyrosine and other essential vitamins and minerals, it cannot.